Home Lifestyle History Name this Church in Belgaum? Name this Church in Belgaum? 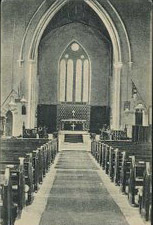 This is old photo of an interior of a church, can you name the church. St Mary’s Church is a major landmark in the town of Belgaum. Designed by Reverend Francis Gell, it is an imposing granite structure built in 1869 in the camp area. The fine pillars in the prayer hall and gorgeous stained glasses at its doors and windows reflect his inimitable craftsmanship. Biblical episodes are depicted in pleasant color combinations on the inner walls. The church attracts large number of devotees from far and near.